4 Bedroom Detached House For Sale in Eastleigh for Offers in excess of £600,000. This Grade II Listed cottage has been lovingly updated by the current owners and today provides an attractive mix of period features such as exposed beams, stripped floor boards, latch doors and fireplaces alongside fresh decor and modern kitchen and bathrooms. The majority of the accommodation is situated on the ground floor and as such the layout offers a high degree of flexibility. The impressive kitchen/dining room boasts a vaulted ceiling to the dining area, travertine flooring and French doors to the garden. The beautiful kitchen incorporates painted units, granite works surfaces, butler sink and an Aga range creating a focal point for the room. The kitchen is complimented by an adjacent utility room with further storage, appliance space and range cooker. Continuing through the ground floor there is a 20ft sitting room with French doors to the deck and pool area. In addition to the reception hall there are three further rooms which could be used as additional reception rooms or as bedrooms, particularly given the bathroom on this level. On the first floor the master bedroom boasts a dressing room and a superbly equipped en suite shower room. The second bedroom is accessed via a separate staircase and benefits from an en suite w/c. Fair Oak offers an excellent range of local amenities, including convenience stores, shops, post office, pubs, takeaways, Doctor's surgery, church and schools. Of particular benefit is the adjacent Lapstone playing fields offering football and cricket pitches as well as tennis courts and access to woodland and open countryside beyond. The location is also well positioned for road networks to the commercial centres of Southampton, Portsmouth, Winchester and Basingstoke as well as train links to London Waterloo at Botley and Southampton Parkway. Furthermore the position is also ideal for the well regarded Wyvern secondary and Fair Oak junior and infant schools. Outdoor pursuits are well catered for with excellent local equestrian facilities, several golf courses, fishing on the Test and Itchen as well as sailing on the south coast. To the front the property is approached via electric gates leading to a gravel drive and detached timber double garage. The gardens are largely to the side and rear of the property. 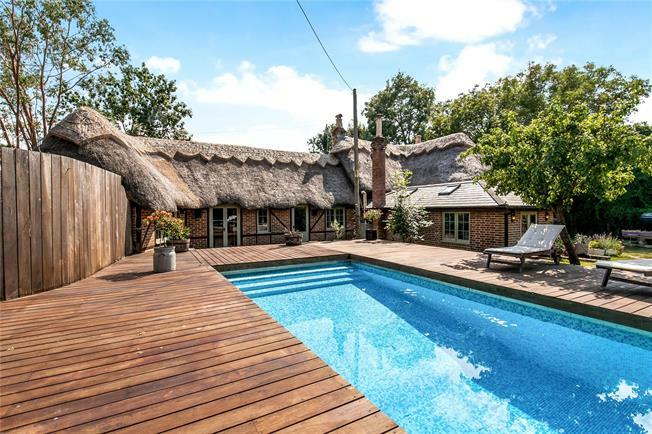 Behind the property is a sizeable decked area featuring a heated outdoor swimming pool. This is a wonderful space for outdoor entertaining and relaxing in the summer months. The remainder of the garden is largely laid to lawn interspersed with trees and shrubs. A gate leads from the side garden on to the adjacent playing fields.